Scotland’s first ever cohousing project for the over 55s has taken a step closer to bricks, mortar and build this week. Plans for the 24 flat property, designed specifically to support independent living for older people, will be submitted to Glasgow City Council’s planning committee for approval in May. The Penington CoHousing project, a first for Scotland, will be built in Glasgow’s Pollokshields area, and will provide 24 one and two bedroom flats and a large shared community living space for individuals and couples aged 55 and over. Working alongside jmarchitects and Southside Housing Association, Penington CoHousing’s Pollokshields project has been carefully designed to match the needs of older residents. 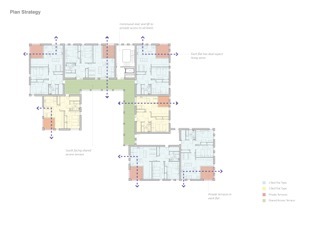 Incorporating full wheelchair and mobility scooter accessibility, the plans provide age-sensitive LifeTime Living design features such as wet rooms, hip height power points and low maintenance gardens. 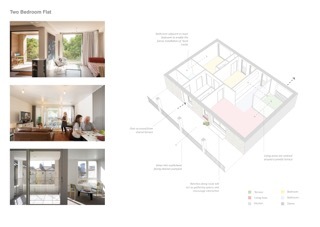 The project build is also designed to a strict environmental and energy efficient brief which ensures warm homes with lower bills for older residents. By providing private flats plus a generously-sized central communal shared space where residents may meet, eat and socialise together, Penington CoHousing believes the project offers a residential model for older people ideally suited to combat to the isolation and loneliness experienced by so many of Scotland’s seniors. With their membership drive in full swing, and their plans now off the drawing board and into the planning system, it seems that Penington CoHousing’s dreams of independent living in old age are about to be set in stone. Get Involved With The European Intentional Community (EIC) Open Day – May 2016!